Our readings this Sunday caution us to lead others by example, with humility and meekness. In our first reading (Malachi 1:14-2:2, 8-10), the prophet speaks on behalf of God telling the priests of Israel that they have violated the covenant of their fathers by leading the people astray. God gives them a stern warning to listen to him. A great King am I, says the LORD of hosts, and my name will be feared among the nations. And now, O priests, this commandment is for you: If you do not listen, if you do not lay it to heart, to give glory to my name, says the LORD of hosts, I will send a curse upon you and of your blessing I will make a curse. You have turned aside from the way, and have caused many to falter by your instruction; you have made void the covenant of Levi, says the LORD of hosts. I, therefore, have made you contemptible and base before all the people, since you do not keep my ways, but show partiality in your decisions. Have we not all the one father? Has not the one God created us? Why then do we break faith with one another, violating the covenant of our fathers? 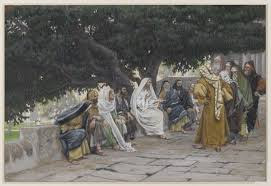 In our Gospel reading (Matthew 23:1-12), Jesus gave a similar rebuke to the scribes and Pharisees, saying they preach but do not practice and lay heavy burdens on the people's shoulders without any help from them. What they do, they do for show. In our Epistle reading (1 Thessalonians 2:7-9, 13), St. Paul gives us an example opposite that of the Pharisees, by practicing what he preached, serving the people out of love. Instead of laying heavy burdens like the Pharisees, he and his companions were "gentle among you, as a nursing mother cares for her children." One lesson we might take from today's readings is that we too are called to keep the "covenant of our fathers" and lead others to Christ by our living example and our love. We can find no better example than Jesus himself and also, St. Paul and his companions. May we act with meekness and humility, giving of "our very selves" to others.